In 2008, The Cannon Horticulture Project, a six-acre organic vegetable demonstration site was established. Heirloom varieties of sweet sorghum, okra, tomatoes and squash have been grown and evaluated and an organic soil building program is in place. Also on site: hoophouses, a greenhouse, and an herb bed. In 2011, the site was certified organic by the state of Oklahoma, in accordance with National Organic Standards. Project Manager George Kuepper has created a bioextensive organic system, using cover crops, rotations, soil amendments such as compost and biochar (made from on-farm materials). Read more about how to design a healthy organic system in your garden or farm. Small Scale Organics: A Guidebook for the Non-certified Organic Grower and Farm Made: A Guide to On-Farm Processing for Organic Producers are among the many resources on organic agriculture produced by Kerr Center and available free to farmers. This three-year educational program began in late 2011, supported by a grant from the USDA’s NIFA Beginning Farmer Program. The project provided in-depth training in sustainable horticulture or livestock production each of the three years. In addition, students learned about business/financial planning, whole farm planning, and conservation techniques. Scholarships were available to beginning farmers and ranchers to attend each year and course materials remain available free to the public on the Kerr Center website. The Kerr Center partnered with the Oklahoma Farmer and Rancher Association (OFRA), the Rural Smallholder Association (RSA), and the Mvskoke Food Sovereignty Initiative (MFSI). OSU Cooperative Extension Service was also a partner. During the first year, training was held at the Kerr Center in Poteau. Year two expanded to include horticulture training at both the Kerr Center and the MFSI offices in Okmulgee, with presentations at the center being shown via webinar at MFSI. Year three included both hort and livestock tracks at both locations. Several hundred prospective farmers went through training. Follow-up was in the form of mentoring by three of the partnering organizations. This mentoring provided one-on-one assistance as beginners put their plans into practice. 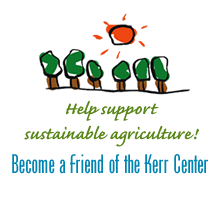 Kerr Center offers internships to college students seeking hands-on experience in agriculture. In 2008-09, four interns came to the center in Poteau. They learned practical skills in a hands-on setting, focusing on the Kerr Center’s program areas of sustainable livestock raising and organic horticulture. Since then, 10 college students from Oklahoma and surrounding states have come to the Kerr Center to learn. To date, interns have been instrumental in helping to launch horticulture and livestock projects. Learn more. In addition, roughly a quarter of interns’ time is reserved for academic endeavors, including reading and study, film screenings and independent research of individual interest. This aspect of the internship can qualify for college credit, and has also contributed several reports to the Kerr Center’s files of online informational resources. Using on-farm resources to build soil and maintain soil fertility, control pests organically and save money is the focus of “resilience farming.” George Kuepper has been working closely with several market farmers in Oklahoma and Arkansas on organic techniques that he has used in the Cannon Horticulture Plots, six certified-organic acres near the office headquarters. Highlighting practical ways farmers and ranchers can incorporate habitat for native pollinators and honey bees, insects that are crucial to agricultural production worldwide. Focus is on the Kerr Ranch and cooperators. Provides Instructors a Useful Framework for Teaching the Essential Points of Sustainable Agriculture. Use as a Supplemental Text for Courses in Agriculture, the Environmental Sciences, and Rural Sociology.